Space station cosmonauts Alexander Skvortsov and Oleg Artemyev staged a five-hour and 11-minute spacewalk outside the International Space Station Monday, launching a small Peruvian science satellite and changing out a variety of space exposure experiments. Russian EVA-39 began at 10:02 a.m. EDT (GMT-4) and ended at 3:13 p.m. when Artemyev re-entered the Pirs airlock module and the cosmonauts closed the hatch. 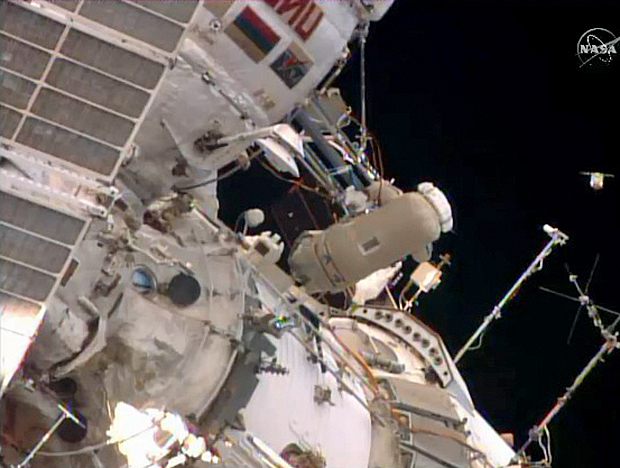 It was the 181st spacewalk devoted to station assembly and maintenance since construction began in 1998, the fourth so far this year and the second for both Skvortsov and Artemyev. Artemyev accomplished the first major objective of the spacewalk just a few minutes after the excursion began, releasing a small "nanosatellite" in the station's wake as the lab complex sailed 260 miles above the southern Pacific Ocean approaching the coast of Chile. The 4-inch-wide cube-shaped satellite could be seen tumbling away against the backdrop of Earth as Artemyev looked on from just outside the Pirs module. The Chasqui-1 satellite was provided by the Peruvian National University of Engineering, working with the Russian federal space agency. The solar-powered satellite, brought to the station last February aboard a Progress supply ship, is equipped with a compact visible and infrared camera system, a radio transmitter and an attitude control system. The 2.2-pound satellite "represents an unprecedented effort in our country for the first time to achieve access to space and gives us the opportunity to open new fields to our own specific geographic and social reality application," the university says on its web site. "It is also, from an academic point of view, a tool that facilitates collaboration (and) trains students and teachers with real-world experience in satellites." With the nanosat deployed, the cosmonauts made their way to a work platform on the Zvezda command module where they attached the Expose-R experiment. Loaded with a variety of biological samples ranging from plant seeds to spores, fungi and ferns, the experiment package will remain in place for 18 months to help researchers study the long-term effects of the space environment. After installing a clamp to help secure an automated phased array antenna that was mounted outside the station during an earlier spacewalk, Skvortsov and Artemyev collected samples of rocket plume residue from a command module window and then installed equipment to help measure the long-term effects of plume impingement on the upper Poisk module. With that work complete, the spacewalkers removed and replaced several other space exposure experiment trays carrying a variety of materials. The cosmonauts ran ahead of schedule throughout the spacewalk and ended the excursion more than an hour earlier than originally planned. "Thank you very much, guys, for your work," a Russian flight controller radioed. NASA had planned to carry out two U.S. spacewalks of its own this month, one to move a failed pump module to a long-term storage position on the station's solar power truss and the other to replace a critical solar array electrical component. But the EVAs were put on hold pending arrival of replacement spacesuit batteries. The new batteries are scheduled for launch aboard a SpaceX Dragon cargo ship Sept. 19. Assuming that flight stays on schedule, NASA flight engineer Reid Wiseman and European Space Agency astronaut Alexander Gerst could venture outside for their first spacewalk sometime in early October, pending management approval, replacing a solar array power system device known as a sequential shunt unit. Wiseman and astronaut Barry "Butch" Wilmore, scheduled for launch aboard a Russian Soyuz spacecraft Sept. 25, then would be clear to carry out the pump relocation spacewalk later in October. Of the two planned spacewalks, the SSU replacement is the most critical for NASA. The space station has been operating with seven of its eight major solar power feeds since early May because of problems with one of the eight sequential shunt units used to regulate solar array output. Equipment on power channel 3A had to be switched over to power channel 3B in May and while that has not caused any major problems for the station, mission managers want to replace the suspect SSU as soon as possible to avoid major powerdowns in the event of another failure. The replacement work is relatively straight forward, but the new spacesuit batteries are required. And the SSU swap-out must be done when the station is in Earth's shadow and the arrays are not generating power. The orientation of the station's orbit with respect to the sun will periodically ensure extended night passes in October.